On campus in early March for the Phyllis Trible Lectures on the future of feminism, I did not expect to run so directly into my past. I know these collisions are likely at Wake Forest, at least for me since I have had so many different lives on both the old and the new campuses. Still, as I sat in the atrium of the library waiting to meet Ed Wilson (’43) for coffee, I could have sworn that professors and friends from my Wake Forest past were also coming to meet me. 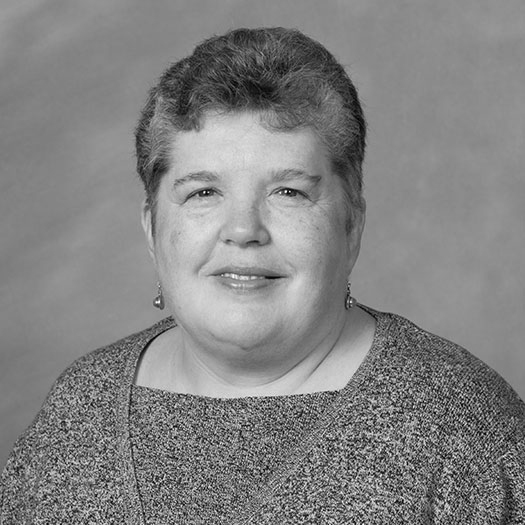 Crosthwaite is a Distinguished Alumni Award winner. Was that shadow crossing in front of me not Claude Roebuck (’40), my philosophy professor from the late 1950s? Was that rather determined woman walking briskly in my direction really Elizabeth Phillips from the English department? What quip about Emily Dickinson would she toss my way? 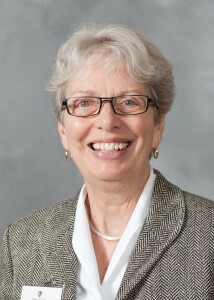 Was it really true that Jeanne Owen had ordered special glasses so that she could read the titles of books on the top shelves — would I find this professor of business law still scouring the stacks for interesting books? I shook my head and looked around at the many students diligently at work, filling most of the tables with their computers, backpacks and books. They were totally unaware of the ghostly spirits hovering among them. Keep it real, Jane! Maybe, I thought, I would actually run into my nephew John, currently a sophomore and reportedly deeply engrossed in mid-terms. But no, no one … but … wait, maybe those students talking at that far table were my close friends, Barbara Sue, Mary Mel, and Jan, my roommate, or Charles or Martin or Stephanie. Maybe I was really losing it. Then I remembered how many hours I had actually spent in this building during our first years on this campus when we literally constructed the theatre on the eighth level — when Dinah Gattis (’59) and Eddie Hudson (’58, MD ’62) were actors, and I was busy back stage with props and gossip. And the haze of distant memories took me back to the night Speech Professor Franklin (Fessor) Shirley found me trying, but failing, to smoke a cigar on the elevator while hauling some chairs and costumes. Why didn’t I remember actually studying in this space? Why did the “study memory” rather seem to take place on the Old Campus where you could actually walk around outside — yes, under magnolias — and look in the library windows to see if some interesting Sigma Chi was pretending to read and had an empty chair next to him? 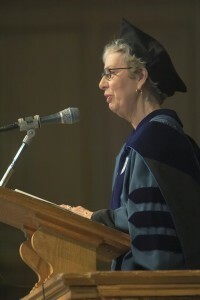 Professor of religion at Mount Holyoke College, Crosthwaite has delivered two Baccalaureate addresses at Wake Forest. So many wonderful full-fledged ghosts now surfaced, too many names and faces and memories ever to name them all — A. C. Reid (’17, MA ’18, P ’48), Bill Angell (’41, P ’72), David Smiley (P ’74), Ed Christman (’50, JD ’53), of course, Carl Harris (’44), and Tom Mullen (P ’85, ’88). I even knew Rhoda Channing, the former librarian, having met her at Casa Artom in Venice, and you know her spirit still patrols in this hallowed place. Libraries, it turns out, are filled with stacks of books — and of memories. Here I was, sitting in the Edwin G. Wilson space, under the Edwin G. Wilson portrait waiting to meet EGW himself, having taken his classes, talked with him among the old card catalog cases, and worked with him when we were both deans. We are, I think, more than happy that the present is so actively haunted — perhaps inhabited, is a better word — by the pleasures, the people, the ideas and the intellectual poetry of the past. May the library continue to be a place where facts and fiction, dreams and drama, hard work and loving memories mix and mingle to help us imagine the future.